Electric utilities have never felt more threatened by the expansion of rooftop solar. After the upheaval of recent years, including a budding trade war and the insolvency of certain manufacturers, the U.S. solar industry resumed its upward trend in 2013. The industry enjoyed record installations, increased financial stability and decreased technology costs. But 2013 is over. So to give you an idea of what to watch this year, we've pinpointed the four hottest solar trends that we will be paying close attention. If last year is any indication, 2014 is going to be another momentous year for solar. The biggest solar news of 2013 occurred not in a lab or on a roof, but in corporate suites. Finding new ways to finance residential solar is a trend that came into its own last year, and it promises to only get bigger in 2014. For starters, there's the success of the little-or-no-money-down, pay-as-you-go residential solar leasing model, which has spurred a growing number of residential customers to adopt solar panels. Third party-owned solar leasing has entered the territory of securitization, which was identified with the housing bubble and subsequent worldwide economic crash, but there are also key differences. Just like mortgages before them, blocks of solar leases are bundled together and sold to pension funds or other large institutional investors. This promises to be dramatic. Securitization lowers the costs of capital for solar leasing companies when they enter the public markets. The securities also offer solar companies a stable income stream. Homeowners are likely to pay their monthly utility bills, unlike home mortgages in recent years when the housing crisis hit. SolarCity, the leading U.S. residential solar installer in terms of market share, closed a historic $54 million bond offering backed by customer contracts in late 2013 to raise capital and fuel expansion. It was the first such offering from a solar installer. But signs are more bond offerings are on the horizon. SolarCity says it will offer another $200 million in securitized debt this year -- and it has plans to offer even more. Meanwhile, non-institutional investors are also gaining increasing access to solar, both through SolarCity's acquisition of Common Assets and Mosaic's crowdfunding platform. Meanwhile, Vivint Solar showed there are other ways to raise capital. It recently closed two rounds of financing totaling $540 million, in addition to $200 million that was raised in the summer. Watch out for other third-party owned solar developers to imitate SolarCity and its bond offerings as well. SunEdison just might. It expects to build about 1,000 MW next year and said it is exploring debt securitizations and other financial vehicles to grow its portfolio. Another financing trend to watch is the creation of yield cos. Solar companies can bundle power plants and spin them off into separate, publicy-traded entities to raise capital. SunEdison is planning a yield co, and First Solar, SunPower and Warren Buffett's MidAmerican Energy Holdings may do so as well. A few IPOs are also to be expected, with SolarCity's success over the last year providing other installers with a guiding light to follow. Companies that could IPO in the coming year are Sunrun and Clean Power Finance. As solar gains traction in the marketplace, expect players in the space to find new ways to help installers raise capital to grow and expand. 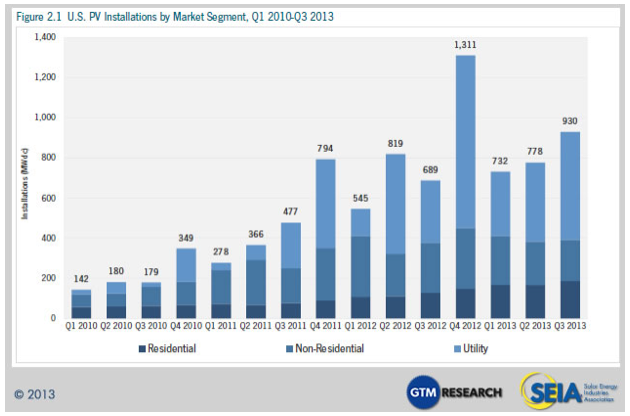 Residential solar has experienced steady, if somewhat gradual, growth to this point. But the market may be well-positioned for a boom. Grid-connected distributed photovoltaic capacity increased by 36% in 2012 over 2011, to about 4,350 MW. GTM Research sees the residential solar financing market in the U.S. growing from $1.3 billion in 2012 to $5.7 billion in 2016. In the coming years, the market is expected to continuing its surge with no end in sight. According to an estimate by GTM Research and the Solar Energy Industries Association, another distributed 4,400 MW will be added this year. The advent of the third-party owned solar leasing model has made it easier for homeowners to sign up for rooftop solar. But the risk for installers is if solar-friendly state and federal policies are slowed or reversed. The first battles were waged in 2013. Arizona Public Service (APS) engaged in a public campaign to persuade state regulators to add a fee on customers with rooftop solar systems. It was technically successful in getting regulators to add a fee (albeit a relatively modest $0.70/kW), but it's unclear who won the fight. APS told analysts during its parent company's earnings conference call that rooftop solar is lowering its electric sales by about 0.5%. Utilities fear that solar installers are poaching an ever-growing share of their residential customers, so expect the fight over solar subsidies to generate heat all year. The battlegrounds to watch are Arizona, Colorado, Georgia and California. Energy storage is finally emerging out from under its designation as the far-off Holy Grail of the electric sector. Intermittent generation has long been the bane of renewable energy technologies, but recent developments in energy storage for solar, especially at affordable prices, are inching closer to reality. Steve Hellman, EOS Energy Storage president, predicts battery storage will be cost-competitive with (or less expensive than) natural gas-fired generation. This is a bold claim, but Hellman believes the time for cost-effective storage is coming soon. And there are some signs that may be happening. Manufacturer Hitachi plans to integrate renewables like solar with its 1-MW lithium-ion battery. The storage systems will be installed on high-voltage power lines to store excess generation and deliver it to the grid as needed. In Arizona, the $2-billion Solana solar project west of Phoenix, is three square miles of parabolic troughs that carry heat to tanks of molten salt. The heat is used to create steam, which can be called upon when the sun is not shining. California utilities are interested in the concept, especially now after that state’s regulators have established the country's first energy storage mandate -- 1.325 GW by 2020. But customer-sited storage may hold the most disruptive potential for utilities. SolarCity is now offering energy storage to its commercial customers. Customers in places like California and New York can mitigate demand charges during times of peak demand. The batteries, leased over 10 years, are from electric vehicle company Tesla Motors, with the first installations expected in early 2014. During power interruptions, the batteries will switch to energy stored from SolarCity’s solar panels. As with financial innovation, expect other installers to follow SolarCity's lead. In fact, Sunpower has already begun to do, saying it will bundle storage with solar for residential customers in the next few years. Utility customers today can bypass the centralized power grid for electricity through rooftop solar systems. “If the cost of solar panels keeps coming down, installation costs come down and if they combine solar with battery technology and a power management system, then we have someone just using us for backup,” former Duke Energy CEO and Chairman Jim Rogers told Bloomberg. "All of this is leading to a disintermediation of us from our customers." That's why distributed solar is a disruptive threat to investor-owned utilities, according to an oft-quoted Edison Electric Institute (EEI) report from January 2013. But can it also be an opportunity? The EEI report encourages utilities to rethink business models and consider "where utilities can add value to customers and investors by providing new services." Utilities are not usually first-movers, but one of these big opportunities is distributed solar. The U.S. witnessed a big year for rooftop solar in 2013, particularly in the residential sector. So if utilities are hurting, it only makes sense that they too get in on the act. After all, utilities already have the customer relationship, unlike third-party developers. Some utilities have already shown a willingness to invest in distributed solar, either through unregulated subsidiaries or utility leasing programs. Duke Energy is one of those utilities that sees an opportunity. Duke has invested in Clean Power Finance, "which manages half a billion dollars of project financing for third-party investors in distributed solar projects," according to Forbes. Likewise, Edison International invested in Clean Power Finance and SoCore Energy, a commercial and industrial solar developer. Integrys also just made its first investment in the residential solar space. If 2013 was all about the ascension of distributed solar, 2014 will be about growth in utility investment. Utilities will either resist rooftop solar as a threat and fight it in the policy arena, or they can acknowledge it is a growth opportunity and invest. Expect utilities to make pivotal decisions on distributed solar in 2014 that will not only reshape their business models, but the entire power sector for years to come.